Why Should You Call Metro Guard For Rodent Control? Rodents leave lots of droppings everywhere. Sometimes thousands. Rodents chew on wires, cables and all sorts of material. 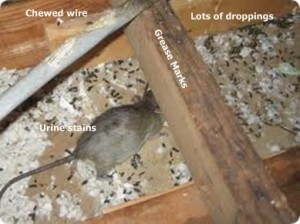 Rodents leave urine and urine stains where they travel. 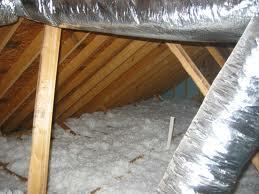 Rodents contaminate and matt down insulation. 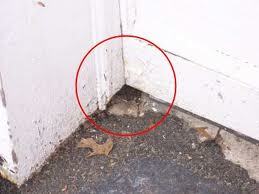 Rodents leave greasy dark rub marks where they travel with scents to attract more rodents. Rodents chew entry holes, many times out of sight. A full inspection is the first step to a good rodent service. Rodents always leave evidence of their presence. Our technicians are well trained and know where to look and what to look for. You can count on us because we’ve inspected thousands of homes and businesses. Our price includes the inspection, treatment and warranty. Whether your visitor is a mouse or a rat, whether they’re inside or out, we have solutions to meet your needs. There’s no risk because our 90 day and 180 day warranties assure you the problem is solved. If you think you may be dealing with rodents, please give us a call today.